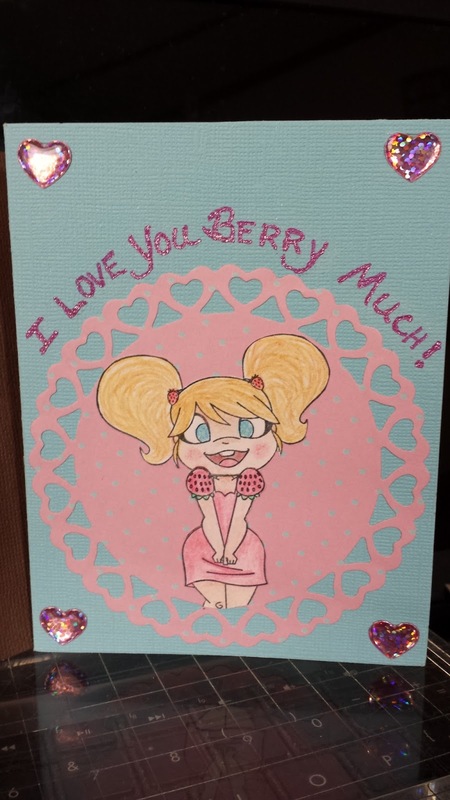 Here is another card I did for another birthday. 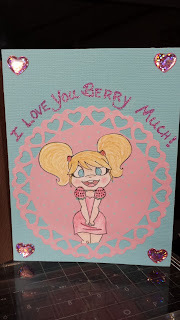 This card took a different path than the ideas I had in my mind on what I wanted to make..... but I thought it wasn't too bad and cute enough to share with everyone who stops in to view my creations. Of course I am beginning to repeat myself when I say... I did not have a sentiment to say what I wanted it to say and one that would bend around the die cut I used for this card design.... so again I decided to free form it since it was a card for family member. I was limited in embellishments at the time I was putting the card together, so I went with something close in color that I found within my stash. The stamp is from CC Design, the Mashi Collection. I just love that collection of stamps.....they put a smile on my face every time. I hope it does the same for everyone who drops in to view this too.